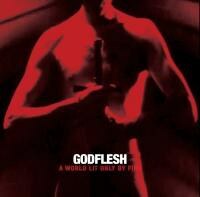 This album's title may suggest that the world is lit only by fire, but Godflesh celebrates the darkness of today to confounding effect. Godflesh hasn't released an album since October 2001. Think about that. A lot has happened in the intervening 13 years, from the War on Terror to the rise and dominance of social media sites like Facebook. Is there even a space in the here and now for a group that was a pioneering industrial band? A World Lit Only By Fire, which follows an EP released earlier this year, is proof that, indeed, there might just be life in the concept yet. Combining industrial with the sludge of heavy metal and the bass-heavy throbs of post-punk, A World Lit Only By Fire is one of those records that grabs you by the throat. There's actually a great resemblance to the metal group Prong in this outing, which is somewhat ironic considering that Godflesh once boasted two members from that outfit. However, this incarnation of the group – consider it Godflesh 2.0 – just features founding members Justin Broadrick and G. C. Green. But for just two guys, they can certainly make a considerable racket. Full of pummeling hooks and dark visions, A World Lit Only By Fire basically rewrites the rule book for industrial. You listen to the genre's origins, and you'll hear bands incorporating the sounds of buzz-saws, drills, presses and so on and so forth into the music. On A World Lit Only By Fire the inverse is true: the guitars, drums and bass sound like metal machinery. It's really refreshing to hear, and a startling revelation. Broadrick and Green squeeze all of the sonic possibilities out of their instruments, and make something that is starkly terrifying, and, yet, cinematic at the same time (No surprise there, as Godflesh has appeared on movie soundtracks in the past). This is music that is all factory fuel emissions, the sort of stuff that billows out of smokestacks and pollutes the atmosphere with all of its toxicity. At times, the sound is vaguely reminiscent of fellow Britons Black Sabbath with its dark droning guitars and adherence to precise beats. However, this is no throwback: Godflesh up the ante by being less druggy and arguably more dark and sinister. That said, there is clarity to the sound, particularly in the use of cymbals, which raises this above the usual sludge rock, too. Godflesh occupy their own space in the metal and industrial community with their own signature sound that is wholly original and pleasing – if this was a band out to please, that is, and I would highly suspect that Broadrick and Green are two dudes who probably couldn't give a you-know-what about what you think. The music simply stands tall. There are a few other things that make Godflesh rise heads and shoulders above their peers. First of all, Broadrick has a unique vocal style. Owing something to death metal grunts, you can still make out individual snatches of words here and there, though sometimes you, the listener, might have to work at it to figure out what he's saying. Second of all, there's no real traditional verse-chorus-verse structure. Sometimes, such as on opening cut "New Dark Ages", the same riff is repeated throughout the song. There are no discernible solos, either. The work of Godflesh is to build a monument in sound and their songs on A World Lit Only By Fire take on the work of modern art, just with jagged razor sharp edges that could easily cut you were you to touch them. The adherence to structure rumbles with a ferocity that is base and primal, and Godflesh hold a mirror to the world of black mire and desolation to stimulating effect. This is a record where you sit up and take notice, with a sound that feels fresh and wholly original, even if it does reference certain UK bands of yore. The uniformity of sound between the songs creates the effect that this is an album, not just a collection of material. This is a Statement with a capital S, even if that Statement's intended purpose is to take your head, dunk it in the toilet and in the hopes that, when you emerge, you aren't breathing. The uniformity, though, leads to a criticism. Since the variation between these 10 tracks is subtle at best, A World Lit Only By Fire can become a wearying, draining experience. In fact, you might just say that this is an outfit that doesn't have songs, per se, just a sound. Even if there are changes in tempo, or the riff changes, it all sounds remotely the same. That's an asset to be sure, but also a bracing liability. Still, you can help but admit and admire that Godflesh have a Vision (again, with a capital letter), and are fiery and revitalized after an unlucky 13-year layoff between proper albums. Largely eschewing their primal and lo-fi sound for something completely fleshed out, you walk away from this disc feeling largely fulfilled and that you've experienced something that is truly vital. The power and heft that two men can make is incredible here, and there's an overarching feeling of triumph, of picking up the pieces from an unexpected and painful break-up, only to come back and smash things to smithereens with their take on what metal and industrial should feel like. A World Lit Only By Fire is revisionist industrial and the soundscapes of this brittle disc leaves you wondering what on earth just hit you. This is slowly aggressive, pealing, symphonic music for those who feel the emptiness and pain of modern living, where morons walk into you on the street because they're too busy jacked into their smartphones, where your only "friends" exist on Facebook, and you need LinkedIn to congratulate you for a year spent working in one job in an era where employees are just meat to fill seats. This album's title may suggest that the world is lit only by fire, but Godflesh celebrates the darkness of today to confounding effect. That's what makes Godflesh so important, and good to have back after such a long time away. This is the real deal, and there's no b.s. – just the truth of the painful reality of existence in the new dark ages of the world in 2014.